"Rhythm & blues mixed with the avant-garde" That's probably the most direct way to describe Frank Zappa's musical influences. Although I shared his interest in the avant-garde I knew nothing about that other stuff. One night long ago I got my first taste of just how little I knew when I got to hang out in Frank's basement listening as he eagerly played some of his favorite 45s. Blew my mind. I've maintained a curiosity about the origins of his "other half" ever since. 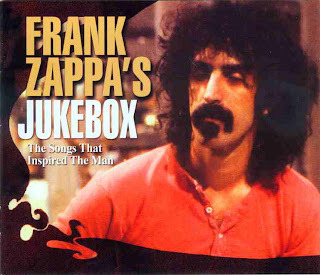 Frank Zappa's Jukebox has two dozen cuts of "tunes" which Frank knew as a kid or mentioned in interviews or programmed in guest DJ appearances or covered in his bands. You can read the full track list here. Richard Berry meets Edgard Varese meets Johnny "Guitar" Watson meets Igor Stravinsky meets Hank Ballard and the Midnighters meets Anton Webern meets the Four Deuces. You get the idea. I've often imagined that an album like this would be useful. Of course this project has no connection with the Zappa Family Trust who will be spinning in their graves for a long time over this release. Only they can produce the album I really want to hear - because it would juxtapose these sorts cuts with Frank's own music and performances. As it is, Frank Zappa's Jukebox is not much more than a random shuffle play. The disc comes with an extensive essay in a booklet - lots of quotes from Zappa interviews. It doesn't really explain why they chose long cuts by Cecil Taylor (really?) and Eric Dolphy - not music that I feel influenced Frank. (I always thought the title to Eric Dolphy Memorial Barbecue was, you know, a parody.) Instead, more Stravinsky (like complete movements from Histoire du Soldat) and the entire Webern Symphony would have gotten the point across more effectively. the defendants pointed out that the Zappa Family Trust trademark may not still be valid in Germany. The ZFT only sells its products online and buyers may only pay in US dollars. There is no ZFT office anywhere in Europe. I like Frank because he's greek and he grew up in Palmdale. An album like this would have been useful ... before 1999. Now, any Zappa fan will have long ago already downloaded every track Zappa mentioned in interviews. Frank was about 1/4 Greek. His father was born in Sicily and was of Greek and Arab decent. His mother was of Sicilian decent with a little French mixed in. pasadenaadjacent, does that mean you only like him a 1/4 as much as you did before? ;) Also, I don't believe his family moved to the Antelope Valley until 1956, putting Frank at 16 so he was already grown up. I was walking today, listening to my iPod and Watermelon in Easter Hay came up. It was rumored somewhere that Frank was listening to this song on his death bed. What a beautiful piece of guitar work. Anyway, I started thinking, what if Frank could have lived 10 more years, what if Frank were alive today. Think of the vault, Mr. Ocker, think of where he was at with the Synclavier at the time of his death and think about what we have today--huge libraries of sampled instruments, not only those common to a symphony orchestra but instruments from around the world and then some. Include cheap storage and massive improvements in computational power since 1993, where would we be today with the prolific drive of Frank Zappa? How far would he have dug into the music that lay deep in his mind, the music musicians may not have been capable of playing, now fully realized? Civilization Phase ?, ramped up composing with clustered multi-core XEON processing under the direction of a workaholic/mad scientist. I wonder if I could even handle it. Oh, the Jukebox album, other than the Varèse, Webern and Stravinsky, I don't know why I would already have any of this music so I too will buy Jukebox and give it a whirl. What would've been on Varèse's iPod? I suspect Varése would have rewired his iPod to make its own unique sounds. Both Cecil Taylor and Eric Dolphy were listed in the Freak Out! booklet, so I figure FZ must've been influenced a bit by them. I think that a section from the final track "...Monster Magnet" must've been influenced by Taylor.